Brides, Here Are The Kinds Of Shoes You Need To Always Be Ramp Ready! A woman can never have too many shoes! How we all dream of having an entire cabinet dedicated to shoes in every colour and size. But let's admit it, we're no Carrie Bradshaw! So as a bride-to-be, what you can do is pick up a few essential pieces that will match most of your outfits and look appropriate at almost every occasion. 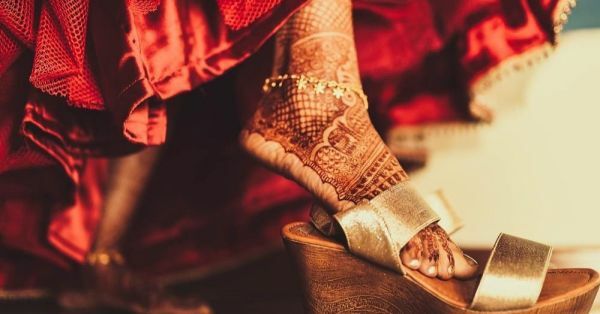 Here are eight footwear styles that you must include in your trousseau. The newlywed Sonam Kapoor has been pairing most of her outfits with juttis from FizzyGoblet and Needledust. Juttis are super comfy and besides the local markets, you now have some amazing brands making handcrafted and customized footwear. Plus, you can pair juttis with lehengas, sarees and even dresses. Here's where to buy the best pair! Kolhapuris can be your ultimate go-to pair at any given time. They're comfy and a basic tan pair will go with most of your suits. If you're not used to wearing heels, a pair of pretty kohlapuris is a must in your trousseau. In fact, we know of a brand that customizes kohlapuris to give it a whole new look. Check out Talking Toe for the prettiest pair ever! For brides who'd like to add some height to their frame but want to avoid the 5-inch pencil heels, kitten heels are for you. For all those post shaadi events or even with your office wear, these will have you sorted. A pair of great pumps is all you need to enhance your look. A must-have in your shoe rack, pumps pair well with suits, dresses and even pants. Go for a gold-silver pair to match all your Indian wear and a black or tan pair for those pretty dresses you've bought for all the dinner dates with hubby dearest. Platform heels give your feet the perfect grip and the thick sole acts as a cushion for the feet. Basically, they're a lot more comfortable than the regular stilettoes and make for a great pick for your wedding day. After all, you'll be standing for long hours! It's not possible for you to wear flashy heels all the time, right? That's where the slip-ons come in. From your beach honeymoon to those late night walks with hubby, these are sure to come in handy. You can even buy the slightly dressier ones to pair with Indian wear. For brides who prefer comfort over style, wedges are a great option. But wait! That doesn't mean that they are any less stylish. Just that they give your feet a good grip so you can even survive walking on the wet grass at a wedding venue! For all the post-marriage rituals too, a pair of wedges is a must. How can your footwear collection ever be complete without a pair of stilettos? So girl, go out there and buy yourself a pair or two cause nothing looks sexier than a sleek pair with your LBD or that sheer saree.